Dura - Hair/Hat Menu Driven/7 hat colors. ATOMIC Cozy Cardigan available in 10 colors. MIranda from Amarelo Manga includes pants, ruffled shirt, collar and belt. My hair/hat is from Secrets . Scripted to resize with 9 color options as well as matte or shiny texture. Credits for Jewerly: Bracelet from U&R Dogs. Necklace from Alienbear. Ragdoll's has made some of the most adorable critters I've seen. The backpack wallaby has animated eyes and a wiggling nose. Rudi Handsome lives up to his name with that cute shiny nose and animated eyes. have the hold pose shown. The Candy Cane mouthies come in 8 colors/flavors and each with a static version and a scripted sucking motion version. 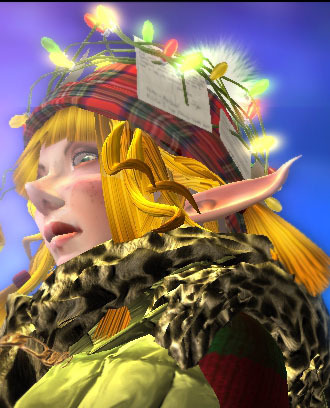 Elf Girl is a complete avatar. You'll get everything you see: shape, skin, ears, hair and the complete outfit right down to the hand held bell and an AO. The AO will allow you to skip merrily wherever you go, dance, ring the bell, blow a kiss, fly and bow in greeting. 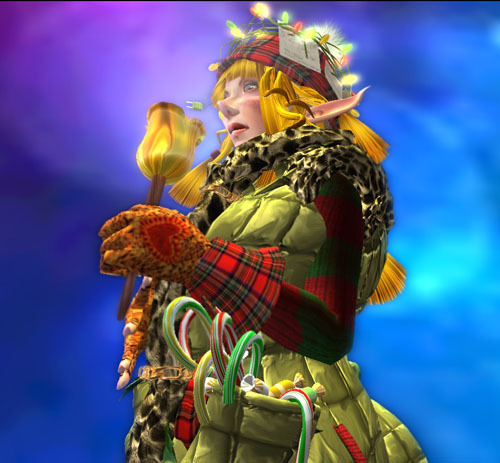 The Elf Girl outfit is detailed with candy canes and holly in the jacket pockets, scarf, gloves, shoes and a hat adorned with Christmas lists secured with a wrapping of Christmas lights. Oh, I almost forgot... she has a frosty breath attachment and smile animation. 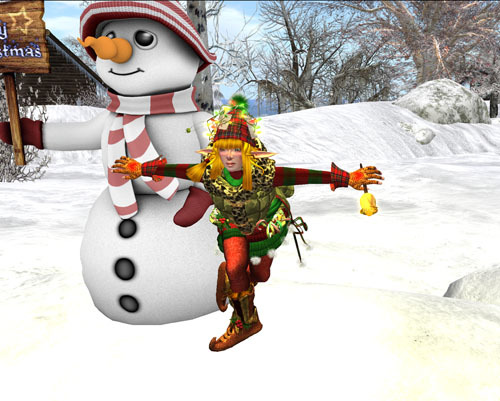 There's a matching male elf avatar in the store! Here's where to check them both out: !GO! Mayden Couture Soana Boots in red are a perfect match for this little dress but available in 5 other colors. Can you believe this adorable little girl's dress is a dollarbie? It comes with the boots too.